1. Provide your child with a quiet, well-lit area and room in which to work privately. Give him space to organize his supplies in a cabinet or stack of drawers. Find an artist’s desk that can be tilted, or provide a small easel, as desired. A desk with shelves above is handy for organizing paper supplies—and a lamp can be mounted beneath a shelf to provide extra light. 2. Furnish your budding young artist with a variety of drawing tools, colored pencils, charcoals, and other media to explore. Purchase good quality supplies and avoid materials that are marketed particularly toward children. For example, invest in Prismacolor pencils instead of Crayola pencils, a sketch pencil set instead of the typical yellow pencil, and artist-quality watercolors, papers, etc. Child-oriented materials can be discouraging when the level of detail and vibrancy of color that the artist is envisioning cannot be achieved. Many websites that offer quality materials for artists are available, so shop around for the best prices. Purchase inexpensive kneading erasers of various sizes, as well as a vinyl eraser. Both types erase much more thoroughly without leaving bits of residue behind, and the kneading eraser can be rolled into tiny tips to erase even in very small areas without damaging nearby details. Get top-quality paints by Artemis or Lyra and excellent brushes—sable hair if you are using oil or acrylic paints. Buy beeswax crayons if the student likes crayons—they’re a lot of fun to work with. A flower/leaf press is also a good investment. Collect things in the natural world and preserve them in the flower press for later work, to accompany decoupage or painting or for use with other artwork. Get some clay and beeswax modeling wax for sculpting projects. Tempera paints are also easy to work with and are completely suitable for use by young students. Provide your student with a ream of white paper (the appropriate weight for use with paints). 3. Provide inspiration by gathering age-appropriate art magazines, as well as picture books that incorporate art by award-winning illustrators. Have friends save old magazines that might have interesting photographs to inspire artwork. Purchase high-quality art posters featuring work by the student’s favorite artists for him to display in his workspace. 4. Plan trips to art museums—or visit virtual art museums online! Take the young artist to museums to see the masters’ works; whatever towns you travel to, go to their museums. Take along sketchpads so that your student can sketch drawings of the work he views in the museum; it is a common art practice to learn from the masters by “copying” work in the museum. With a pad and a charcoal or pencil, the student should be left to do his work for as long as is possible—undisturbed. Do call and request permission ahead of time for your child to sketch his representations of the artwork he views; some museums have special policies about this—a few do not permit it. Many art museums now have virtual exhibits you can view online. Recently a few museums have added an extraordinary amount of visual detail to these images, and it is possible to zoom in more closely than ever to see brush strokes and textures. In fact, these days you can get closer to many famous paintings online than you can by actually viewing the piece in a museum! 5. Let your artist follow his natural inclinations as he draws—if he is doing it naturally, just let him keep creating. If you put your child in lots of classes or over-encourage his talent, he may lose interest. Just let your artist enjoy doing what he loves best, and he will find his own passion. 6. Expose your young artist to a variety of styles and media. Some gifted students have the ability to stay extremely focused, which can be a good thing, but as they get older they will tend to stick with one thing almost to the point of obsession (which actually can be a good thing if you are raising the next Picasso, Degas, or Mary Cassatt!). 7. Give verbal encouragement that goes beyond simple admiration. Communicate interest in your child’s choices of colors or techniques that are especially pleasing to the eye. Encourage him to articulate his reasoning for choosing a certain color, using a certain brush stroke technique, etc. Taking a genuine interest in your child’s artistic process lets him know that he has an attentive audience and also encourages him to go deeper and wider in his own artistic explorations. Communicating your interest in his love of creating artwork is perhaps the most important thing you can do as a parent. 8. Find a mentor. Ask around at local art clubs to find out whether there might be a retired person willing to mentor your child. 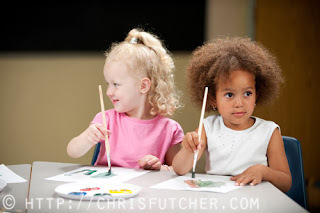 Artists often enjoy the company of other artists, and your child may enjoy having a companion to paint or draw with—and learn from. 9. Consider investing in video lessons. There is a DVD program called Atelier (www.homeschoolart.com) that introduces the student to a variety of painting and drawing styles. Something like this is more useful than a video series that showcases only one particular artist; those should be avoided. You will want your young artist to see and practice an array of styles, not learn merely to copy a single artist’s style. If he is talented, this will come easily, but it may mask the development of his own style. 10. Publicly showcase your child’s work! If you want to attract some attention for your young artist, contact local libraries, city halls, civic centers, and even restaurants to see if they showcase the work of particular artists. Usually it involves you doing all the matting, hanging, etc., but this type of encouragement goes a long way for most gifted children. There are also 4-H fairs and seasonal art fairs to be considered. Find out early about what events are scheduled in the future, as well as requirements for entry. This will give your child plenty of time to prepare his displays and even decide if he wants to offer pieces for sale. If you feel a need to downplay your child’s work, to keep him from becoming too “prideful,” remember that gifted children are often extremely self-critical. What looks great to you may seem lacking to him. Honest praise and encouragement can help build the confidence your child is looking for. Offering to help him share his work with the community goes beyond a desire to gather fleeting compliments; it can give a child a real reason for producing his art—an audience.